Analysing the finger length is a part of palmistry because they can show how we express ourselves and how we have developed in the past. We all have distinctive looks and the same goes for our psychological make-up, and that is why reading hands can become very involved and complicated. It is this personal disposition that reflects in our hands from birth. The finger length, shape, and size are considered when analysing the hands, and because we can easily see the fingers, it makes evaluating the characteristics instant and simple. In a palm reading, these clues to the character make the interpretation more precise and accurate. 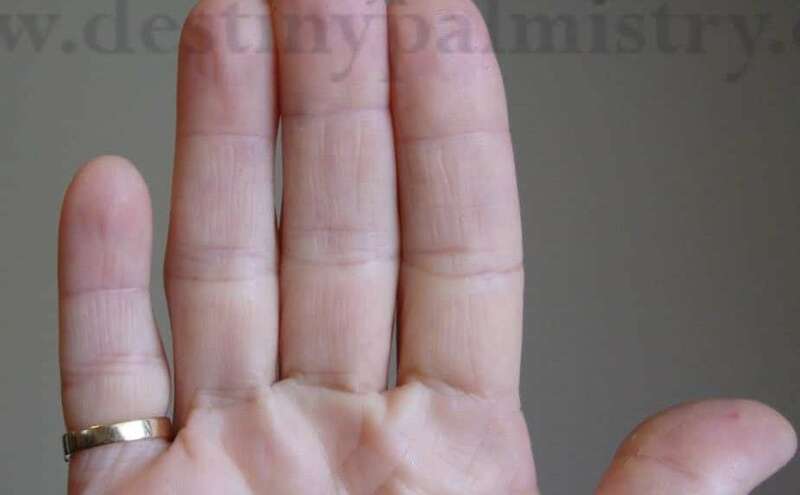 However, many people do not fall into a category where the fingers are unusually long or short, but rather average. It is fair to say that if the fingers appear balanced in relation to the palm, then the character is likewise. The fingers are classed as short when they look shorter in proportion to the rest of the hand, except the earth shape; where the whole hand seems short (or square). As with the long fingers, there are varying degrees of shortness, with the qualities being more pronounced in the very short fingers. Physical or intuitive drives dominate the use of intellect. However, this does not indicate a person’s ability or actual intelligence, but merely the way in which the person functions in their behaviour and attitude. They are passionate, restless and impatient; giving no time for details and everything needs to be done fast. With this lack of interest in trivial matters, they have the ability to get to the point and see the whole picture. Speed and action are what they are all about, possessing an abundance of energy and enthusiasm, (if the fingers are not soft) they are physically capable people. They are quite brave but mostly impulsive in their actions, hence accident prone or easily make mistakes. Happy and lively by nature. If the short fingers are thin, it shows someone more tactful with a need for freedom. Long finger length, whether long relatively to the palm or with an extended palm, reveals someone who is more mentally active than physically. Technical, slow-moving and slow talking, their mind is the driving force for their life purpose; carefully investigating every option with their suspicious mind, in whatever they do. Their feelings are easily hurt, especially in a water hand. Often, the major lines are what people look at most when questioning about their palms. But some of these lines can and do change. What is evident in your hands now, does not mean that there is a fated outcome from what we see. Therefore, as our thoughts and desires change, new lines can be formed, and old ones can fade. The lines which are most liable to change are the minor lines and tend to do so as our goals or motivations change. The major lines are least likely to change quickly over time. The palm ridges and fingerprints do not alter at all. You may be lucky in love, money, travel or have a special gift! Have your personal palm reading here. There is more to analysing hands than just reading the lines. It is a combination of comparing aspects of the whole hand, and so it can take some time to do. The basic shape of the hand is especially an important part of reading the palms because it is what helps us to determine the first and most essential character of the person. Discovering this extra information can give you direction in life or more confidence in your abilities. Did you know your fingerprints can reveal your possible life purpose or choice of career? Career palm reading here. Please help with a small donation so that we can continue to teach palmistry online. Thank you!